New York: A six-foot stuffed grizzly bear guards the entrance to the offices of Fleckenstein Capital Inc., located on a quiet, leafy street in the Capitol Hill neighbourhood of Seattle, US. 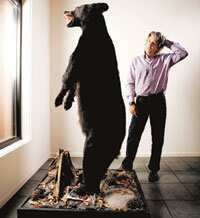 The bear sends a clear message: The man inside, Bill Fleckenstein, founder and president of the firm, is a short-seller, and proud of it. Since world markets began their most serious plunge in decades in July, 17 countries have banned or restricted short-selling, including the US, Canada, the UK, Germany, France, Switzerland, Australia, Japan and Taiwan. Commentators around the world have labelled short-sellers hyenas, jackals, vermin or vultures. Fleckenstein says investors who bet that stocks will decline, as short-sellers do, are simply bears. And, he says, they are not to blame for the market meltdown. “Short-sellers didn’t lower the Fed funds rate or tell people to take out mortgages when they shouldn’t have," he says. “Now we are the bad guys, the ones wearing black hats." Fleckenstein’s offices are a monument to his trading strategy, in which investors borrow stock from institutional investors and then sell it in the hope of buying the shares back at a lower price before returning them to the lender. The grizzly bear was wearing a “Dow 10,000" baseball cap when the index was still at 11,000. Fleckenstein is one of a corps of pessimistic investors who have been blamed for market manipulation since the 17th century. The recent attacks began after a rapid deterioration in the share price of Bear Stearns Companies Inc. in March. When Bear Stearns’ stock fell 47% on Friday, 14 March, the US Federal Reserve stepped in and that weekend brokered the sale of the investment bank to JPMorgan Chase and Co. Later, Bear Stearns chief executive Alan Schwartz told US Congress that the firm was toppled by rumour mongering and abusive trading—often euphemisms for short-selling. The Securities and Exchange Commission (SEC) launched an investigation that was still in progress in mid-October. After Bear Stearns’ demise, each new crisis in the banking sector raised alarms about short-selling. When the share prices of Goldman Sachs Group Inc. and Morgan Stanley dropped sharply on 17 September, Morgan Stanley CEO John Mack declared in a memo to his staff, “Short-sellers are driving our stock down". And in testimony before Congress on 6 October, former Lehman Brothers Holdings Inc. chief executive Richard Fuld singled out “naked" short-sellers as one of the culprits in the firm’s 15 September bankruptcy. Naked short-selling occurs when a short-seller tells his broker to sell shares that the seller has not yet borrowed. On 17 September, SEC ruled for the first time that naked short-selling amounted to fraud. On 28 October, Japan banned naked short-selling in its markets through 31 March 2009. In the UK, the campaign against short-sellers also goes back to March, when the Financial Services Authority (FSA) said it suspected that “false rumours" linked to short-selling led to a sudden drop in the share price of HBOS Plc., the country’s biggest mortgage lender. An FSA investigation found no evidence of abuse. In September, when Lloyds TSB Group Plc. agreed to buy HBOS for one-fifth of its value a year earlier, both Archbishop of Canterbury Rowan Williams and Archbishop of York John Sentamu continued to blame the short-sellers, with Sentamu calling them “bank robbers". The 2007 annual report of the Church of England shows that its £5.5 billion (Rs43,890 crore now) of assets included a £34.5 million position in HBOS and £40.4 million in Barclays Plc., whose stock also plunged in September and October. The Church of England Pensions Board at the end of 2007 managed another £850 million, including £8.5 million worth of HBOS shares. In response to the furor, FSA banned short-selling of the stocks of banks, insurance companies and securities firms from 18 September through the rest of the year. A day later, SEC imposed its own ban on short sales of 799 financial stocks. It later added 170 more companies, including International Business Machines Corp. and Sears Holdings Corp. The SEC ban, after one extension, expired on 9 October, six days after passage of the $700 billion (Rs34.86 trillion) US bailout plan for the banking system. In the time the ban was in effect, Standard & Poor’s 500 Index lost 17.7% of its value. Short-sellers say they are scapegoats for the real villains in the meltdown. “The shorts who warned about the real estate bubble have been proven right," Fleckenstein says. “Now the government has changed the rules overnight. They’re blaming the shorts and bailing out the ones who lost all the money and almost took the financial system down." Manuel Asensio, 53, president of New York-based Mill Rock Llc., says he and his brethren keep the stock market honest by going after companies with rotten accounting, dubious business plans and excessive debt. “There was a legitimate reason as to why the financial stocks went down; it was mispriced securities on their balance sheets that caused the problems," he says. Mill Rock is a hedge fund that holds long and short positions in equities and invests in distressed bank loans. After mid-2007, when two Bear Stearns hedge funds collapsed, investors had every reason to believe financial shares would decline, says George Feiger, CEO of investment manager Contango Capital Advisors Inc., which oversees about $2 billion in Berkeley, California. “Short-selling is an expression of doubt, not a criminal activity," Feiger says. “The management at Lehman, Bear Stearns and Merrill kept saying everything was fine. Then, every few weeks, they would write off billions." In fact, by early-2008, financial shares were so volatile that James Chanos, founder of Kynikos Associates Ltd, which runs a $5 billion short-only fund, says he stopped shorting them. “We have the least amount of financial shares short in our portfolio than we’ve had in four years," Chanos said on 13 October. “We’re looking elsewhere." The power of short-sellers has been greatly exaggerated, says Douglas Kass, founder of Palm Beach, Florida-based hedge fund firm Seabreeze LP Holdings, which manages $200 million. “The dedicated short pool totals about $5.5 billion," Kass says. “Dedicated" short-selling firms run funds that do nothing else. “That’s too small to have an impact." The ban on short-selling has exacerbated the financial crisis by driving dozens of hedge funds to the edge of bankruptcy, says Richard Baker, president of the Managed Funds Association, a hedge fund industry lobbying group. Quantitative hedge funds were put in the most jeopardy by the ban, he says. They use sophisticated computer algorithms to choose a group of stocks to buy. They then hedge the bet by shorting a second set of stocks. Their response to the short-selling ban has been to cut back on trading, he says. Convertible bond funds have been hurt the most by the ban. Investors who buy convertible bonds—bonds that can be converted to stock at a certain price—usually short the same company’s stock as a hedge against a fall in the price. Financial companies sold more than $30 billion of convertible bonds in the first nine months of 2008. In September, convertible bond arbitrage was the worst-hit hedge fund strategy, plunging 16.6%, according to Chicago-based Hedge Fund Research Inc.’s HFRX index, against a 6.9% fall for the industry. Most academics agree with Kass that the power of short-sellers is overblown. “In the current crisis, shorts are like flies on a carcass on the side of a road," says James Angel, a finance professor at Georgetown University in Washington who studies short-selling. “We should focus on who or what killed the animal." Under certain circumstances, short-sellers can manipulate stock prices—either through concerted action or through a “feedback loop", says Itay Goldstein, a finance professor at the Wharton School at the University of Pennsylvania. A feedback loop is simply a chain reaction. An example might be when creditors refuse new loans to a company after reports surface that there is heavy short interest in its stock, Goldstein says. Short interest is the total amount of stock that has been borrowed by short-sellers. The credit pullback leads to a further share decline and a decrease in the value of the firm. “It’s hard to tell whether the recent market decline is due to manipulative attempts," Goldstein says. “The conditions were such that this is quite possible." The short-sellers have marshalled statistics in an effort to prove they played little or no role in the 2008 market downturn. Kass, for instance, points out that Morgan Stanley offers no data supporting chief executive Mack’s contention that short-sellers were responsible for his company’s stock price falling 44.5% in the three weeks ended on 18 September, the day short-selling was banned. “It was the longs getting out," says Fleckenstein. “Probably the insiders."